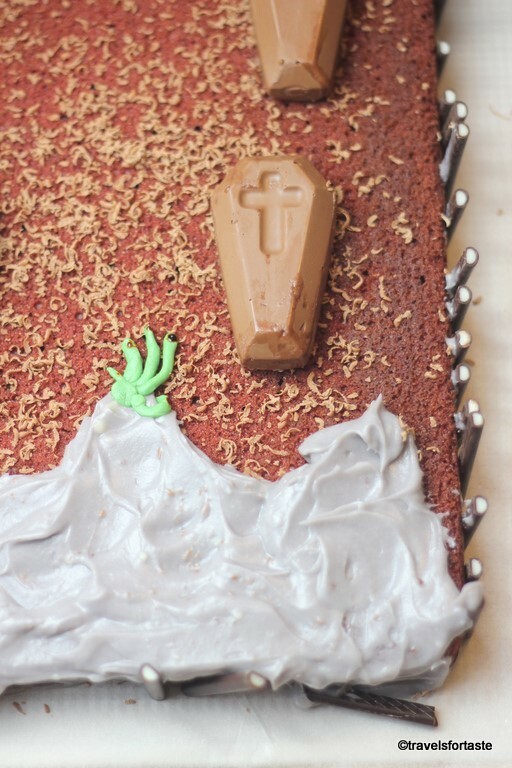 Halloween is just around the corner and it is a great excuse to get creative with your bakes. ( As if you need any more excuses that the excitement surrounding this year’s GBBO! I can’t wait for the final next week …eeekkkkkk) Because its also half-term, baking with kids around should involve easy recipes and loads of scope for little hands to get involved. 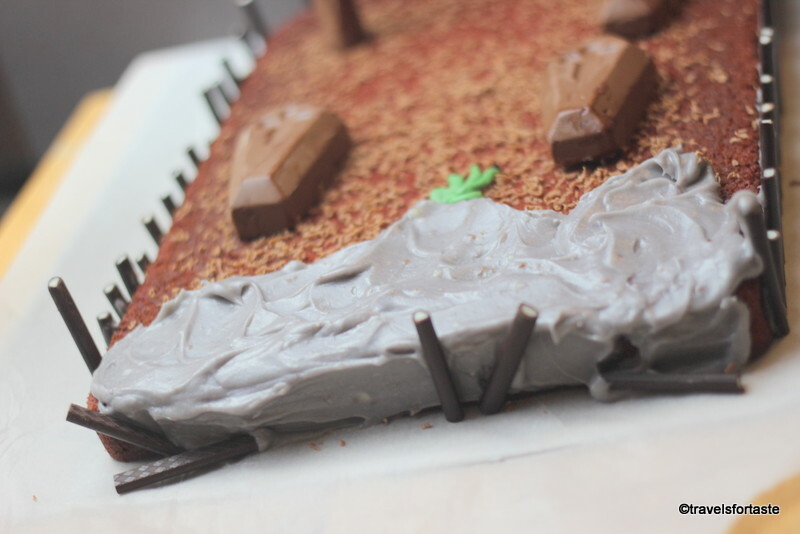 Brrrr… 🙂 Am sure you and your little helpers can add more spooky effects to the cake! Just let their imagination run wild like I did. 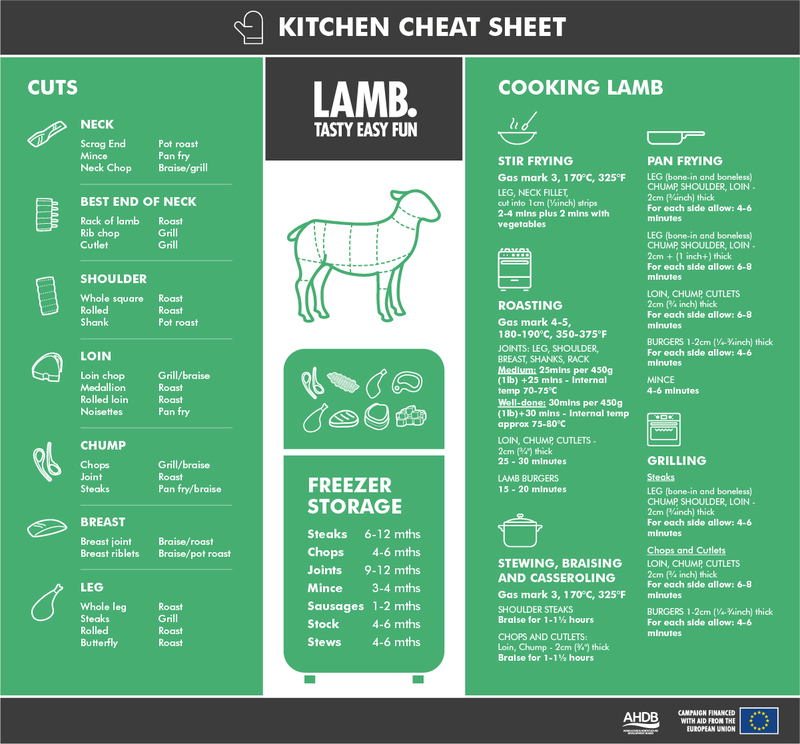 But first, let’s get to grips with the basics! 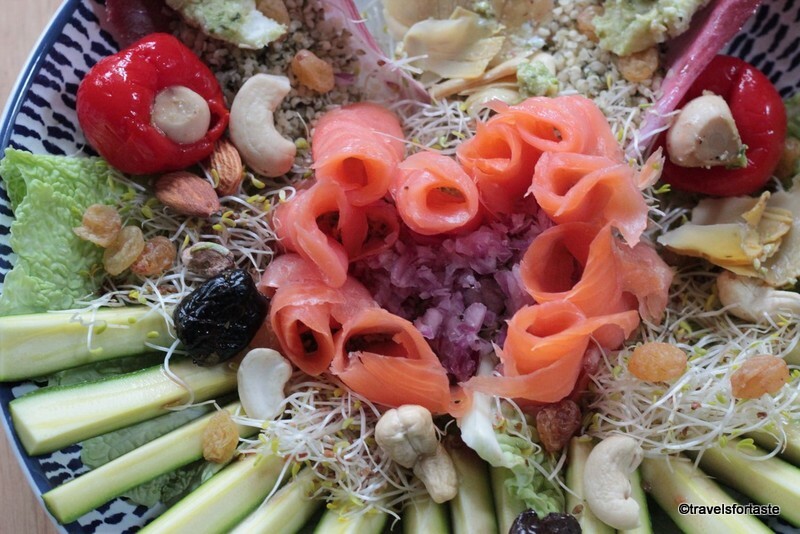 Unleash your creativity by mixing up the fillings and flavours for each coffin! To make the alien hand I used a tiny amount of green coloured sugar frosting and ‘painted’ nails using black food colour and a toothpick. For the tree stump I have used a Cadburys flake and for the chocolate fence surrounding the graveyard perimeter, I used mint chocolate sticks. 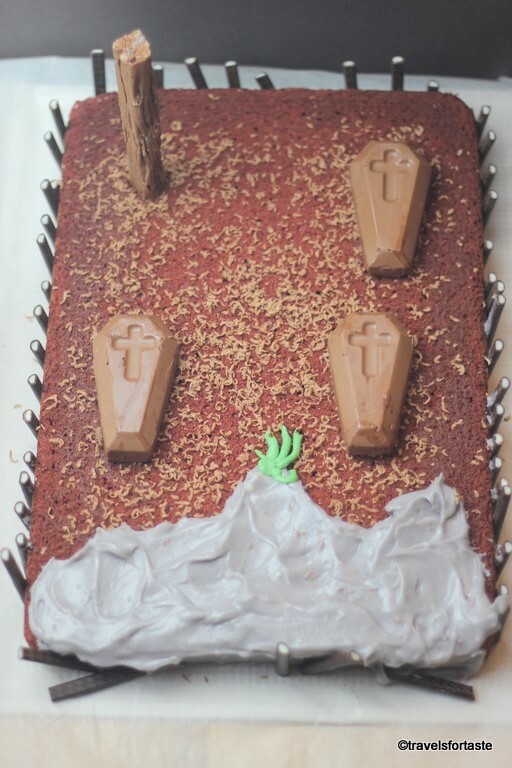 A small amount of cream cheese frosting applied using a toothpick serves as edible glue to attach the sticks to the sides of Forgotten Graveyard cake. 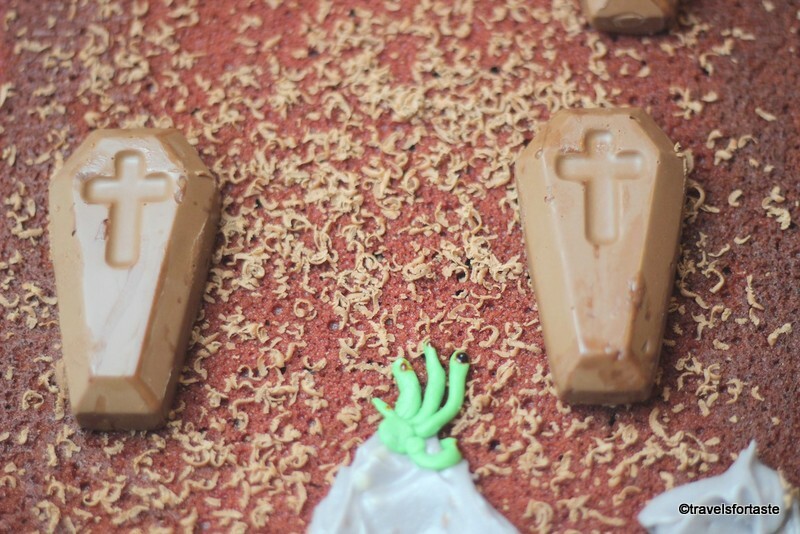 The ‘maggots’ on the graveyard cake are simply shaved chocolate curls. What I really want to mention here is though that I used my new OXO non-stick pro cake tin and am very happy with the result. The tray is sturdy and my cake came off very easily, thanks to the two-layer coating which is PFOA-free, and ceramic-reinforced. This also makes this gorgeous cake tin scratch, stain, corrosion and abrasion resistant. I didn’t need to use baking parchment – which I find very fiddly. The reason the cake came off so easily was the beautiful micro-textured pattern which allows for even baking. And after my cake completely cooled I moved it to my superb new OXO non-stick Pro commercial grade baking plate. This wide baking sheet gave me enough surface area, around the bake to decorate and display my creation, making it really easy to photograph it too. Spreading the grey ‘slime’ cream cheese frosting was a doddle thanks to the handy OXO bent icing wand. One lucky winner will be picked automatically by Rafflecopter. Deadline for entering this contest is 25th Nov’ 2017 midnight GMT. Entry is open only to residents of the U.K, except Scotland and Ireland. Increase your chances of winning by visiting daily and tweeting out the pre-recorded tweet, provided you have completed all other steps the first time you enter. 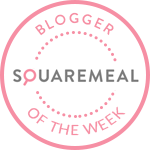 The giveaway prize bundle as mentioned in the post is worth £50 – an OXO Non-Stick Pro 12 Cup Muffin Tin, OXO 11" Balloon Whisk , OXO 7 Piece Measuring Cup Set and an OXO Bent Icing Knife. Neither OXO, nor I am liable for any damage of giveaway contents in transit. Please allow a minimum of 15 days for delivery of the prize, which may reach earlier or later. The giveaway prize will be sent directly by OXO. The prize is as stated: it is non- transferable and no cash or other alternatives are available. The winner will be notified on 26th Nov’ 2017 on Twitter by me and here on my blog post. I shall tag the winner on Twitter via their twitter id. If you are declared as the winner you agree to allow me and OXO to contact you via email id and share your details with OXO who will arrange for the goodies to be sent out to you, the winner also agrees to have their name announced here on my blog post and on Twitter. If the winner fails to respond by 30th Nov’ 2016 then another winner will be chosen at Random. Please note photograph is post is only representative and actual OXO products and other goodies sent may or may not differ. CONGRATULATIONS to the winner Sidrah A and Thanks to everyone who participated! Deadline for entering this contest is 26th Nov’ 2017 midnight GMT. Increase your chances of winning by visiting daily and tweeting out the pre-recorded tweet, provided you have completed all other steps the first time when they enter. 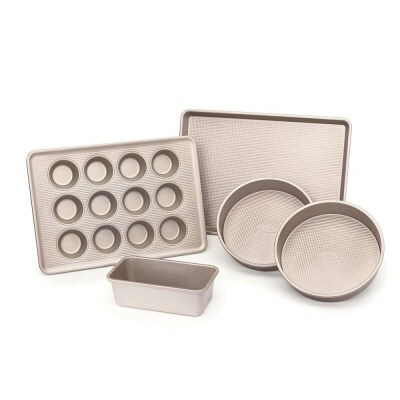 The giveaway prize as mentioned is a bakeware bundle worth £50 from OXO consisting of a Non-Stick Pro 12 Cup Muffin Tin, 11″ Balloon Whisk, 7 Piece Measuring Cup Set and a Bent Icing Knife. Neither OXO, nor I am liable for any damage of giveaway prize in transit. The prize is as stated: it is non- transferable and no cash or any other alternatives are available. The winner will be notified on 27th Nov’ 2017 on Twitter by me and here on my blog post. I shall tag the winner on Twitter via their twitter id. If you are declared as the winner you agree to allow me and OXO to contact you via email id and share your details with OXO who will arrange for the goody bag to be sent out to you, to have your name announced here on my blog post and on Twitter. If the winner fails to respond by 30th Nov’ 2017 then another winner will be chosen at Random. *With thanks to OXO. *Sponsored posts help me keep my blog going and I can continue sharing fun recipe ideas with all of you. The countdown to the most opulent and bright Hindu festival of the year has begun. DIWALI – the festival of lights is knocking on our doors. Delicious spicy shredded paneer bhurji encased in a delicate filo pastry parcel and baked to just the right temperature. These bite-sized mini parcels of deliciousness pack a punch of flavour and are certain to become a crowd pleaser in no time. These mini ‘firecrackers’ explode when bitten into engulfing one’s palate in a riot of beautiful flavours and textures. A great recipe to rustle up quickly and impress guests, perfect for both at a planned party or for surprising those guests that drop in unexpectedly. And with ASDA by my side, I can bring home all these beautiful ingredients and unleash my creative side in the kitchen. It also gives me an opportunity to save some precious time and spend it with those that matter most – my family – and celebrate this amazing and lively festival with pomp and pageantry – at home. Cook on a medium flame for about 2 mins, stirring to ensure the paste doesn’t burn or overcook. Remove this mixture from the pan and allow to cool, once it has cooled down blend the mixture to make a thick paste. Add 1 tbsp water to blend to a smooth consistency. Cut the sheet using a pizza cutter into large rectangles. If you find this fiddly place the sheet on a muffin tray and cut using a scissor. Hard-pressed for time? Make the mixture ahead of time, it stays forup too 2-3 days in the chill tray in an air-tight container. You could also make extra portion of the tomato mixture and the cashew-almond paste and freeze them separately. If you plan to freeze the tomato paste – do add a pinch of salt while making it. This recipe has step-wise measure ingredients that I have tested not once but twice before sharing. I take recipe development very seriously – this recipe will not let you down! This dish is meant to tease the palate before a festive meal. 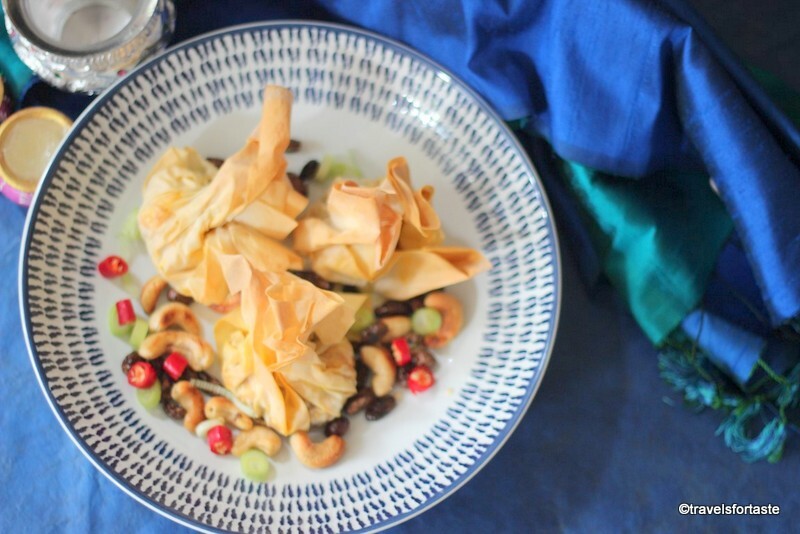 The vibrant spices ensure an explosion of flavour and the rich cashew-almond paste adds a regal twist which also balances the flavours ensuring those who are not partial to heaty spices can savour this dish too. Congratulations – you have in your repertoire a cracking crowd-pleaser recipe. Now all you need to do is to go stock up that list of ingredients 😉 – time crunch? No problem – shop online! ASDA has some really cool offers for Diwali, why not check out the speical Diwali offers here before you head out to ASDA? I have stocked up on oil, ghee, spices and a few store cupboard essentials – after all, it helps to have time-saving tricks up our sleeve! *With thanks to ASDA. As always, all opinions expressed are always my own. Cake ! 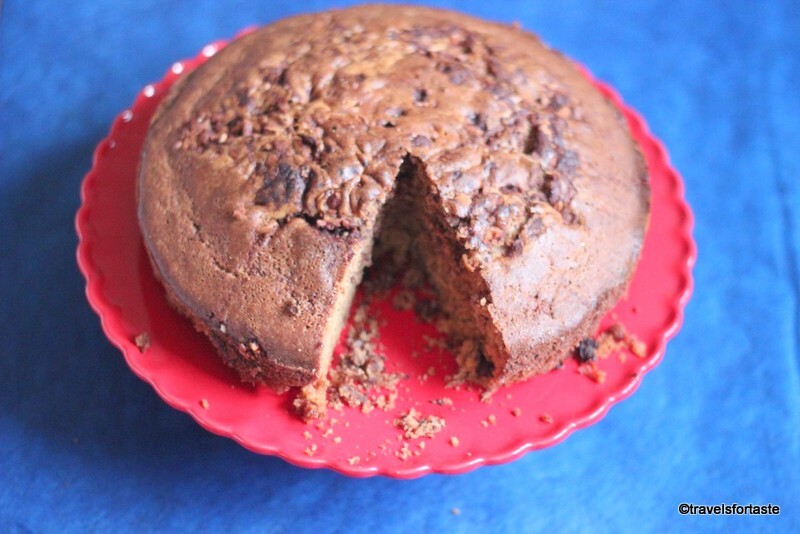 Brilliantly easy afternoon tea cake with crunchy pecans, lots of cinnamon and plus it’s Gluten Free! After a really long time, today I felt like baking a really big cake. Sometimes the desire to bake just takes over and then I have to get all my baking paraphernalia out and just enjoy the process. This classic coffee cake is what we in the U.K would serve for afternoon tea and doesn’t actually contain coffee. It is a modified recipe for a classic sour cream coffee cake. This cinnamon pecan coffee cake is not also gluten free. I am particularly pleased with the outcome of this one because I literally just threw things together and poured the entire cake mixture into my lovely removable bottom cake tin. Another reason am rather pleased with the outcome of this bake is that I have been working with alternative flours for a while now. Ever since I made these fluffy GF, dairy free finger millet pancakes with no eggs and no refined sugar almost 2 years ago, I have made many more things using various flours. Currently am rather obsessed with Teff flour and have even made some very yummy pancakes with them. But unfortunately haven’t been able to get the recipe up on time for Pancake Day today! And though I have finally managed to finally get back to blogging after a hectic but fun 3-month project, I still have to get all my ducks in a row. Looking for healthy pancake recipes? Try my Finger millet and blueberry GF, dairy free and refinded sugar-free, eggless pancake recipe or why not try my mixed flours amaranth and finger millet mixed berry GF pancakes recipe – which is also dairy-free and eggless and can be made vegan! So this baking session also gave me an opportunity to finally try the sample of gluten-free self-raising flour sent to me by the lovely Vicki or ‘Free from Fairy’. I too have studied Biochemistry after my B.sc in Lifesciences. I didn’t pursue my research in Biochemistry though as I did my MBA in Marketing and life took me on another track. But I have always loved reading about and understanding the science behind food and various ingredients. 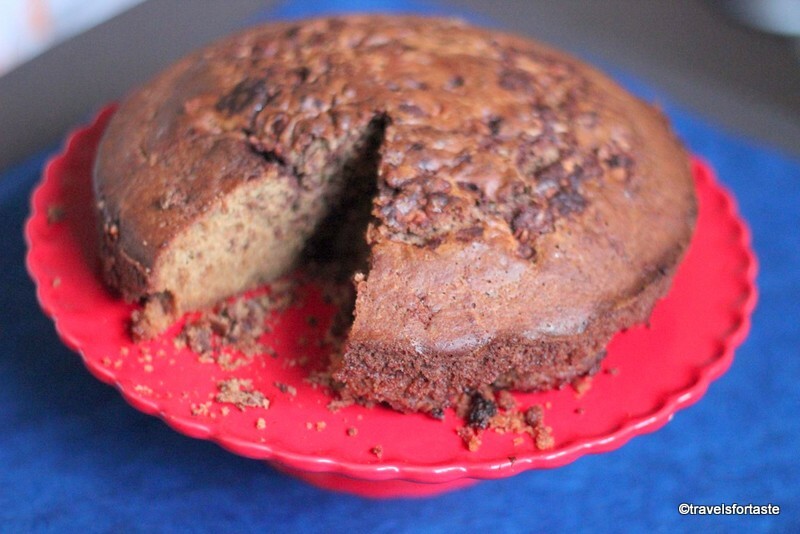 And I am very satisfied with the consistency and results with Vicki’s fabulous blend of self-raising flour – Gluten free whole grain which is also rice free and has a mix of teff, sorghum and buckwheat. All of these flours I love working with! So here is my version of the recipe, I do hope you make this cake and enjoy it with your afternoon cuppa as it is ‘Time for a cuppa’ Day – a week where the charity Dementia, U.K raise awareness and support fund-raising activities. Also, it was St. David’s day yesterday and yes I love the google doodle but am also happy that I have been to Wales four times in the last six years – that’s a lot! Lucky me, twice to enjoy my stay and do every a food blogger would love to do, with some really good blogger friends and the other two times to explore the beauty of Wales and relish the food. I have used Fairtrade dark chocolate in my recipe as 27th Feb was the start of the Fairtrade Fortnight. I met and spoke to many interesting brands at the Fairtrade Christmas show last year in July in London, more on that in another post coming soon. But both A and me, are very drawn to Wales, especially to Snowdon. I did start writing a series of travel posts about our Welsh adventure but never really managed to publish all my posts. Why not have a look at what we got upto at Holyhead in my post here and also check out the breathtaking views from Southstack lighthouse in my post here? Lastly I swapped sugar with Natvia, so all these swaps make it a healthy bake right 😉 Definitely lighter on the conscience, in moderation of course! 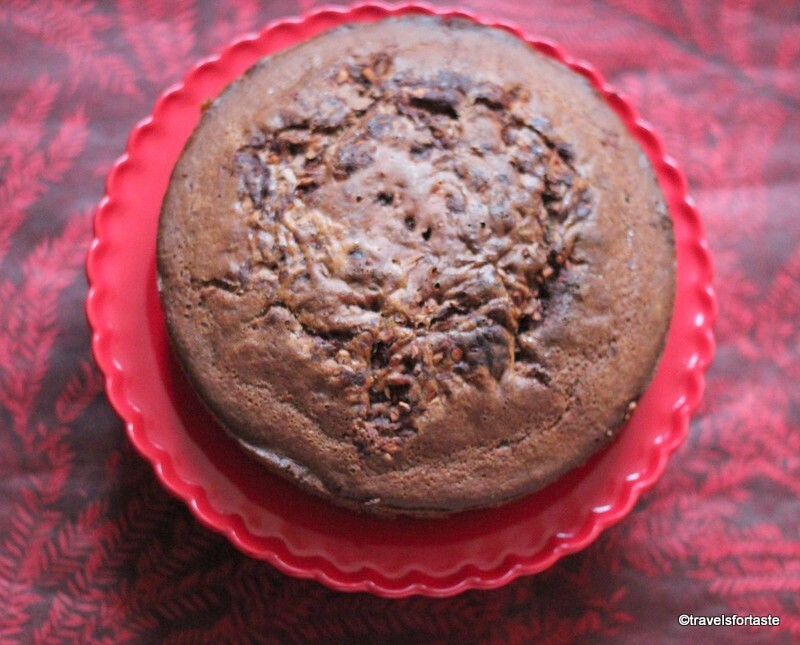 an easy to put together cake recipe, a quick bake for afternoon tea, an <g class="gr_ gr_91 gr-alert gr_spell gr_run_anim ContextualSpelling ins-del multiReplace" id="91" data-gr-id="91">all rounder</g>, this <g class="gr_ gr_89 gr-alert gr_spell gr_run_anim ContextualSpelling" id="89" data-gr-id="89">bake</g> gets full marks for being easy, quick, GF and fun to make! Grease a 12'' cake tin using a generous blob of the unsalted butter and pour enough cake mixture to make a thin layer then sprinkle some of the pecan mixture. Repeat at least 3 times until all the cake and pecan mixture is alternatively used up. Bake in the centre of the pre-heated oven at 18- deg cel for one hour. Check using a toothpick or a thin knife to check if cake is done by inserting it into the middle of the cake.If it comes out clean then the cake is done. Place cake tin on a wire rack and allow to cool completely before releasing the removable base of the tin. Serve with freshly brewed tea. Stores well in the refrigerator for at least a week in an air-tight tin. 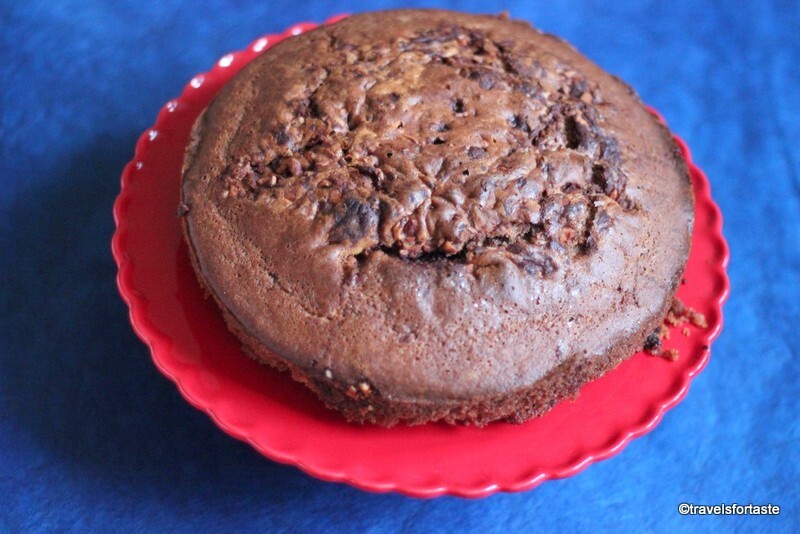 This cake contains soured cream and I wouldn’t keep it for longer than a week refrigerated but would love to hear from you if you have stored it longer and how. Winter evenings in February are always unpredictable, even though some days are warm, evenings are always chilly. During transition periods the trio of cold, cough and flu makes an appearance. 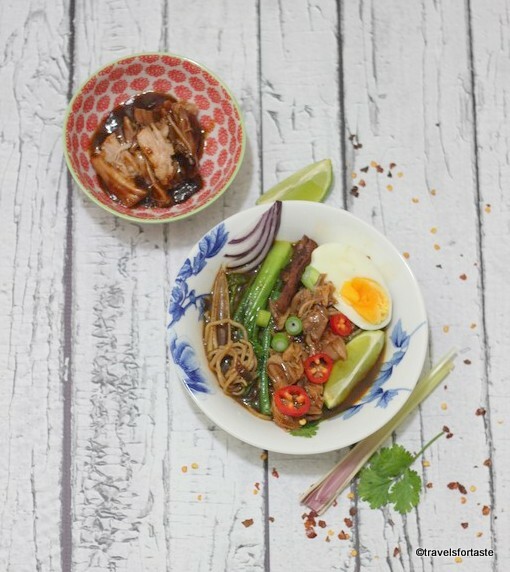 At such times I mostly crave a hearty filling bowl of soupy noodles with a spicy zing and yesterday I had the perfect excuse – a chilly evening -and a freezer full of frozen delights from Iceland Foods World Famous Foods range. 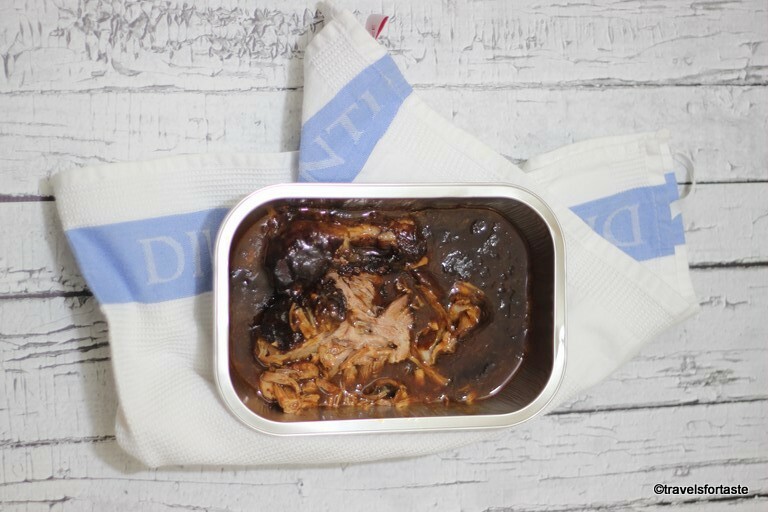 I cannot resist juicy BBQ pulled pork and thought an aromatic warming noodle soup topped with BBQ pulled pork was an apt choice – soup to warm your cockles and BBQ flavours to welcome the new season which is just around the corner. 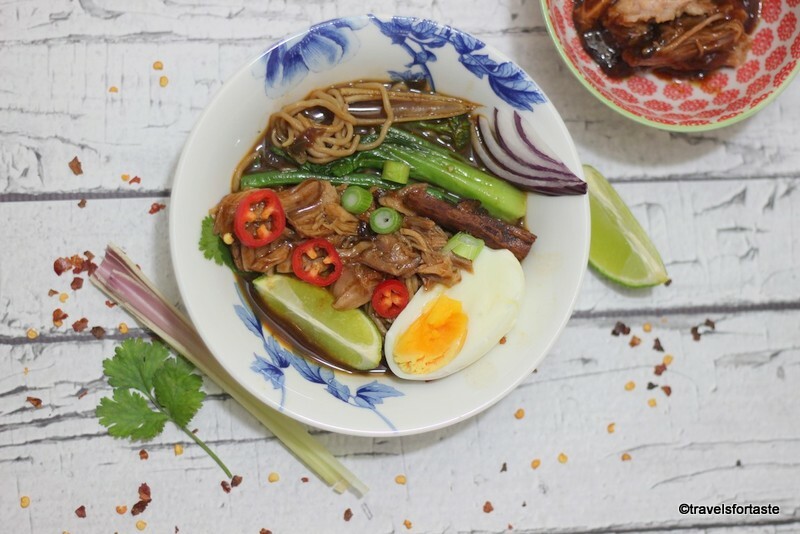 Isn’t it great that you can enjoy summery flavours from across the world at any time you please by just stocking up your freezer with these delightfully diverse and flavoursome foods? The sheer convenience of having the #PowerofFrozen at your fingertips allowing you to create a whole host of budget-friendly, tasty meals that not only you and your family can enjoy but are perfect crowd pleasers. To make their frozen range even more convenient is the Chilled Life on the products, which clearly states how long a product can stay in the fridge to ensure that its high quality and taste are not impacted. Smart way to free up precious freezer space especially in the summer! To make the meal healthy I used zero fat, low calorie and low carb, gluten-free noodles and very less oil on high heat. You could swap the oil for a 1 cal oil spray too. 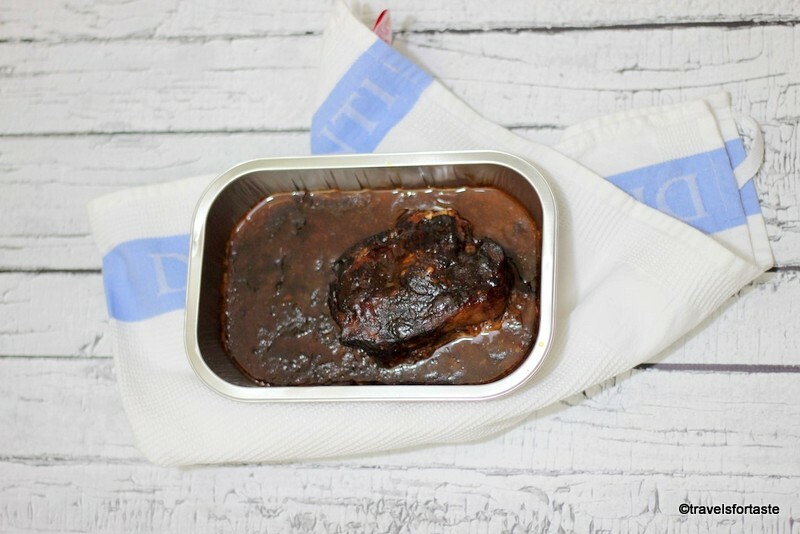 Iceland Foods has re-christened their slow-cooked range as the World famous foods range. Add some water to thicken the stock if it is too thick and then added the cooked noodles. Throw in the sliced lemongrass stalk and sugar. Add the pak choi and cook covered on a low heat for about one minute. To serve, add the noodle soup in each bowl then garnish with fresh coriander and some chopped spring onion. Place about 2 heaped tbsp of pulled pork in each bowl. Seve with a wedge of lime. Both hubby and I loved the thick and flavourful rich BBQ sauce and used some of the leftover sauce to drizzle over mushrooms stuffed with mature cheddar and oven cooked with just a spritz of chilli garlic oil – the result was mouth watering! The entire range of World famous foods is available in stores at Iceland Foods from 20th Feb’17. The World famous range includes: Hoisin Duck Wings, OHSicilian Half Chicken, BBQ Mississippi Pulled Pork, BBQ Texan Down & Dirty Pulled Brisket, BBQ Memphis Baby Back Ribs, Minted Lamb Shanks, Garlic & Rosemary Lamb Leg. To find out more head to the Iceland Foods site here. This post was commissioned by Iceland Foods. As always all opinions are always my own. Although the past few days have been quite rainy and grey, we did manage to catch some sun on Sunday afternoon. It was a great opportunity to get the BBQ out and enjoy some grilled seafood. Our back garden has a little area at the back which is perfect to fire up the grills, it has the benefit of being sheltered from the wind thanks to a massive pine cone tree. 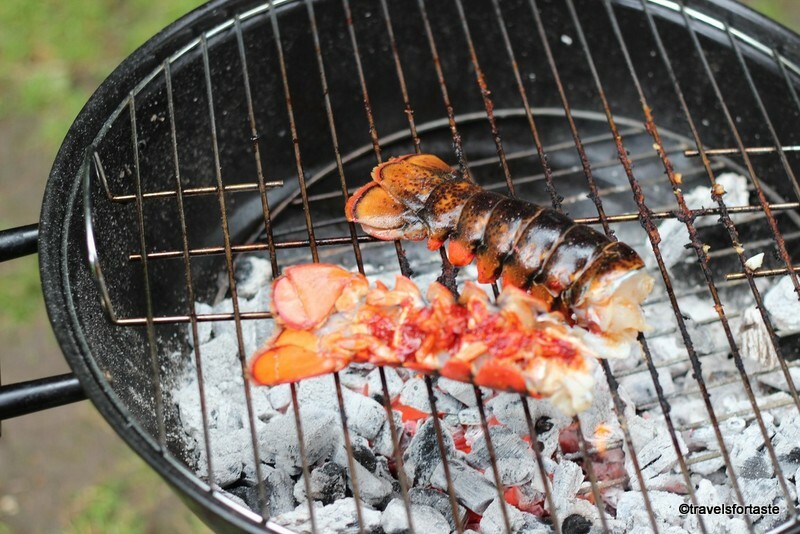 I have been eyeing the frozen Luxury Canadian lobster tails in the freezer at Iceland for many weeks now and Sunday presented just the right opportunity to get them out from the freezer and onto te grill. Though I have cheated and used a ready to use tandoori masala mix for my recipe, it is dead easy to create the masala on your own. But when faced with only a 2-3 hour window when the sun is shining down on us, I had to act fast! 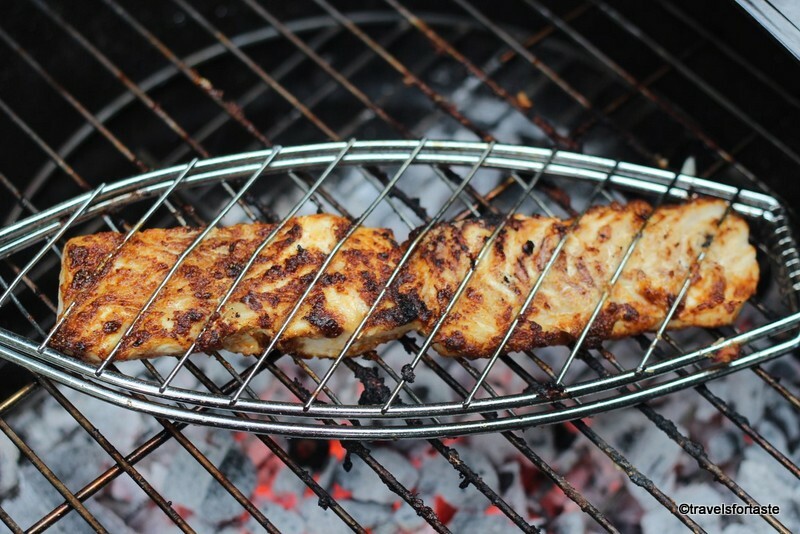 We are big fans of seafood in our family and last week I had worked on creating a very easy spice rub for grilled fish. You can use this spice rub for prawns on skewers or for dusting onto whole fish like those frozen sardines that you get at Iceland too. Now let me warn you that though it may appear that we had the perfect BBQ , it was right after a heavy downpour, which can catch you unawares, so it’s best to not wait for the sun to appear but stock up your freezer with your favourites from the frozen range that Iceland has to offer. I always have frozen kale, green peas and some fish in our freezer. But the sheer variety of vegetables, fish, meat and meat all ready to go on the BBQ will leave you spoilt for choice. 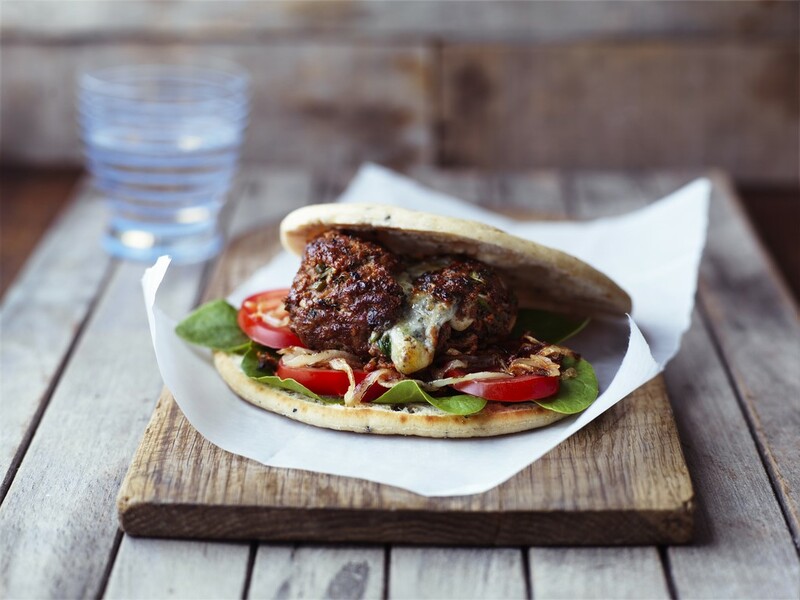 From juicy prawns to succulent kebabs there is something for everyone to choose from. And if the weather does play spoil-sport then my recipe will give great results even when made using a pan indoors. 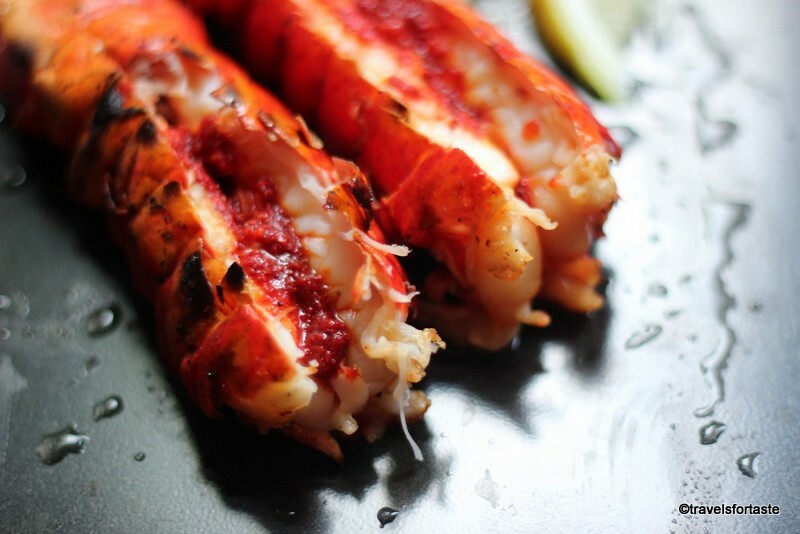 Savour a taste of India with my easy to make juicy tandoori lobster tails, buttery and spicy all at once. 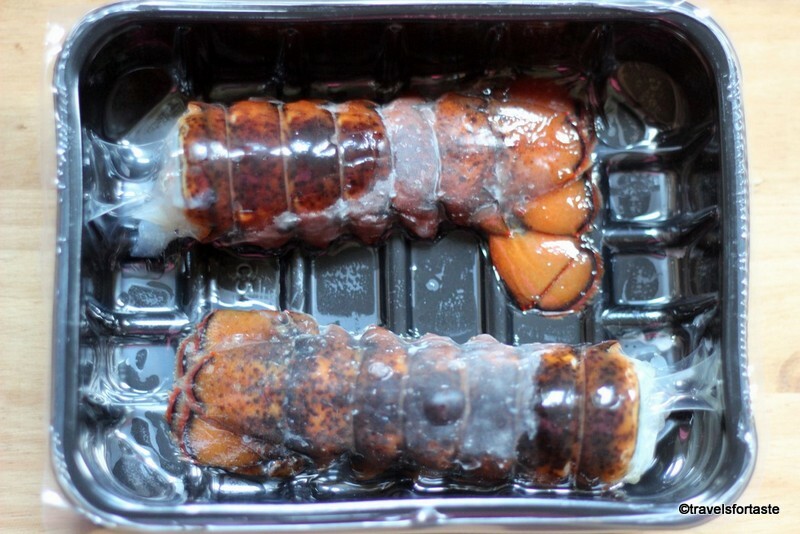 Ideally, allow the lobster tails to defrost overnight in the refrigerator, but with our unpredictable weather try my easy method for an instant defrost - hold the lobster tails under running tap water to remove any ice clinging to the tails. Then place them into a zip-lock pouch and hold it under running water. Allow to rest for about 10 minutes and then repeat the process twice. Use a sharp kitchen knife or scissors and cut a u-shaped piece of the hard shell from the back of the lobster shell to reveal the vein. Ensure you remove the entire vein. Alternatively, after the BBQ , the shell comes off more easily and the vein is visible more clearly as it is dark black in colour and comes off very easily. Either way, just ensure you remove the vein before tucking in. Melt the butter in the microwave and add the tandoori masala powder into it. 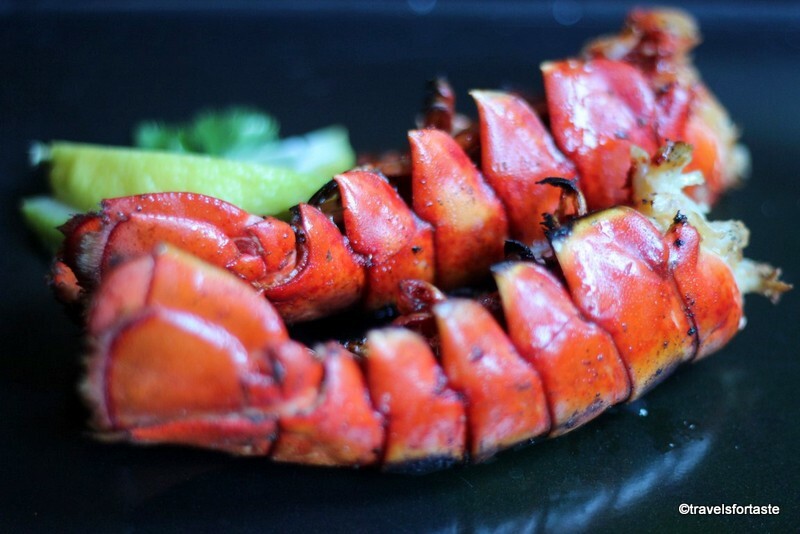 Use a brush to apply the spice mix generously to the fleshy bit of the lobster tail. I would recommend serving grilled seafood like fish, lobster tails or prawns on skewers along with grilled corn on the cob. Iceland freshly frozen mini corn cobs – 625gm for £1 are such a budget friendly delight to have in the freezer. 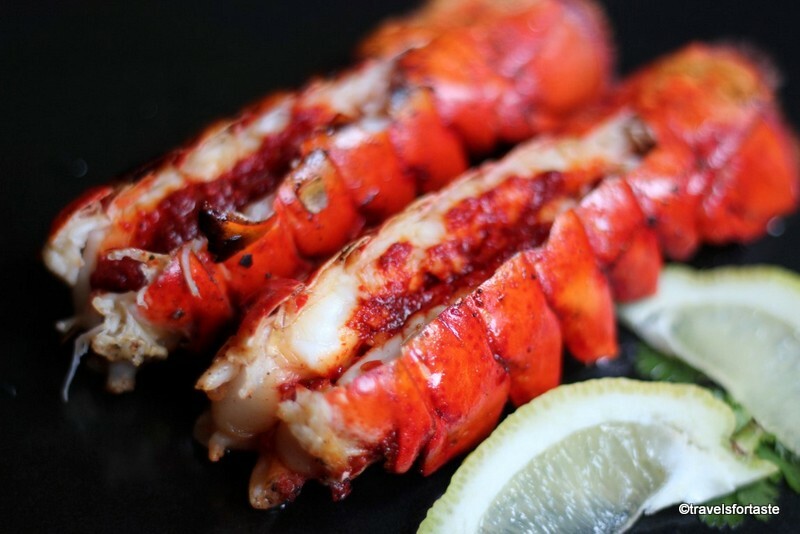 The Power of Frozen gives you quality and value that is not expected for luxury seafood especially lobster tails. 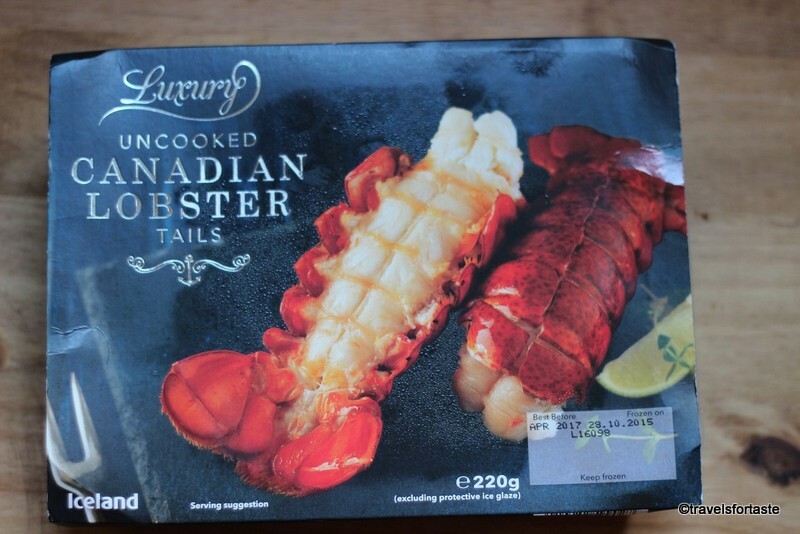 All the natural flavours are sealed in and when you bite into a juicy lobster tail you can rest assured that the nutritional goodness is intact. 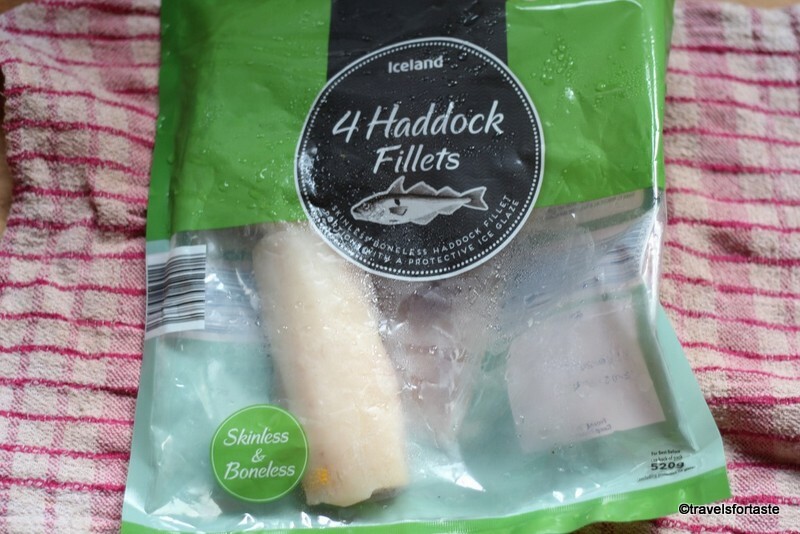 To complete our seafood BBQ feast, I choose Iceland’s 4 haddock frozen fillets. It was tough choice compared to the 4 boneless Atlantic salmon steaks but personally, I love haddock and how it takes up Indian spice rub flavours over other fish. 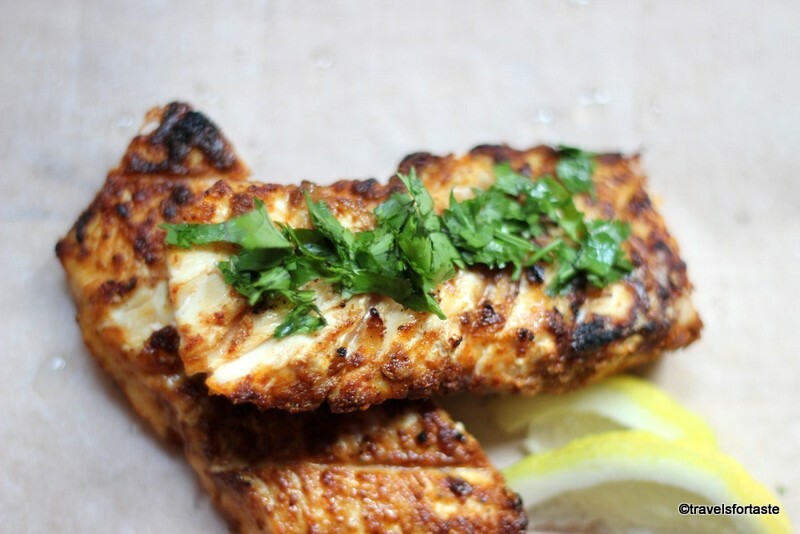 With results similar to tandoori fish kebabs, this flaky fish lends itself well to hot and fragrant Indian spices. Slater on the marinade onto the fish generously and place two fillets at a time gently inside a fish grilling wire basket. Place onto the BBQ and cook on each side fro few minutes. The fish is cooked when it appears flakey and opaque. Because these fillets are thin and on direct heat they cook through very quickly, take care not to overcook to avoid dry fillets. 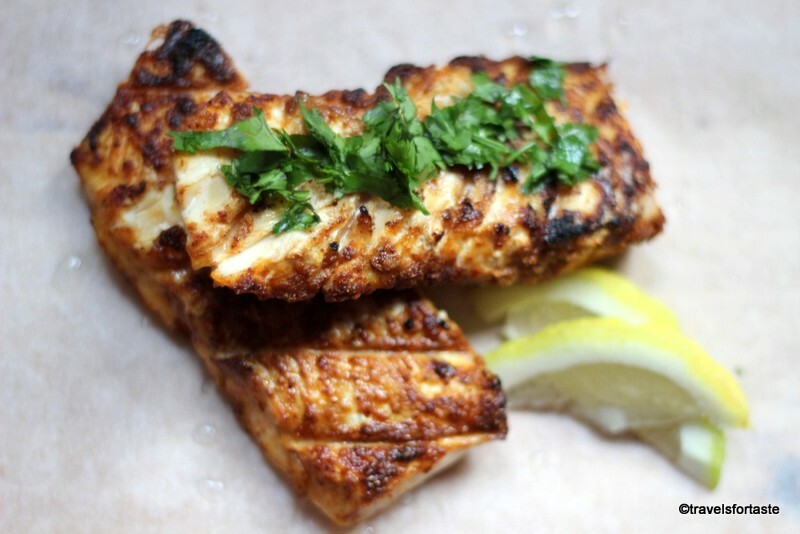 Squeeze a lime generously over the grilled fish and top with finely chopped fresh coriander leaves for truly fresh flavour that compliments the spices in the homemade spice rub. This post was commissioned by Iceland. As always all opinions are my own. 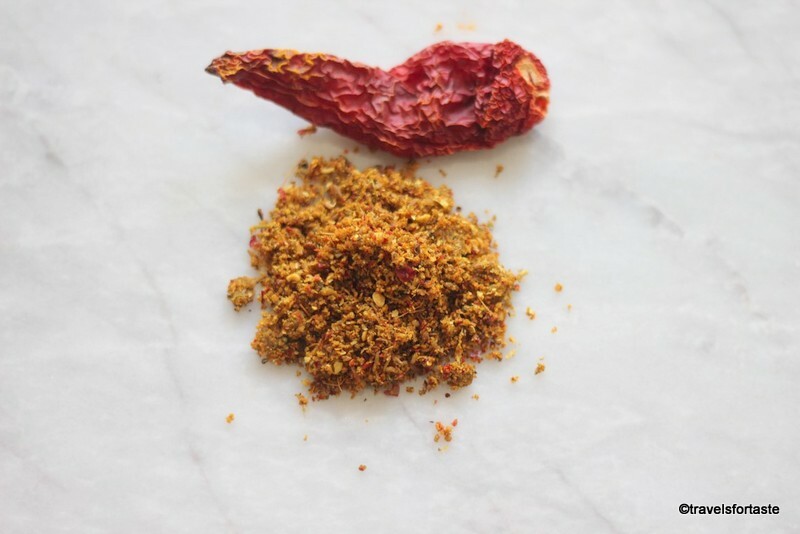 Grilled, BBQ’ed, fried, steamed or baked – we love fish in our house and I have created my own recipe for an Indian spice rub. I used this on haddock fillets on the BBQ this Sunday and the result was very satisfying. Even with frozen fish fillets straight out of the freezer onto the hot grill the spice mix hit all the right notes. It was incredibly to create this spice rub at home using my Optimum G.21 Platinum blender, the panel has six pre-programmed functions which are a real no brainer and one of those functions is ‘Grind’. I try and use my Froothie blender as much as possible and not just for my morning smoothies, it has just made my life that much simpler! Add all ingredients into a grinder and blend till you get a grainy consistency. Don't grind to a very smooth paste because the texture this consistency will lend to the fish, will hit the right spot on your palate. A finer texture I think would work better for meat. Though this spice rub is suitable for freezing, since it contains garlic and fried onion I would not advise to keep in the freezer for over 10-15 days. 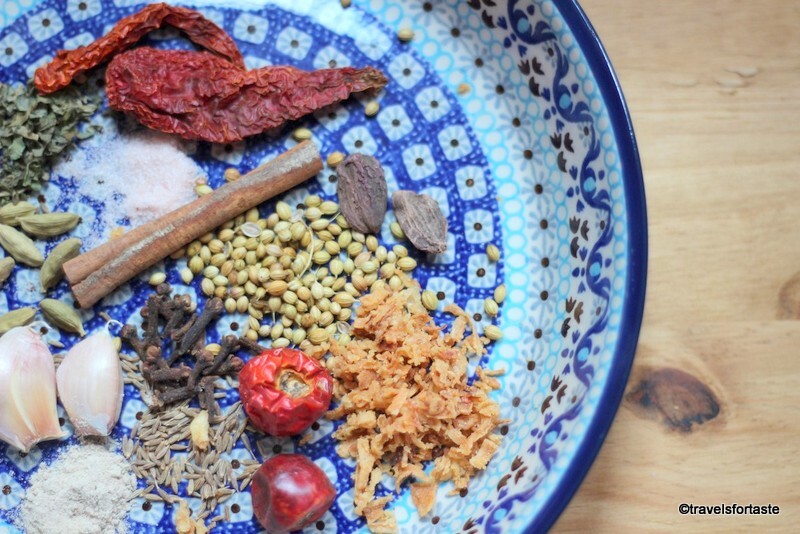 If you make a small batch and very little remains try adding into your curry for a lift in flavour. If you do not deal well with spicy red chilli flavours then rule out the whole round red chilli completely and instead add a small pinch of paprika just for a hint of flavour. These quantities yield enough spice mix for 2 medium sized fillets with a little leftover. If you want to use it for 4 or 6 fillets simply double the quantities. 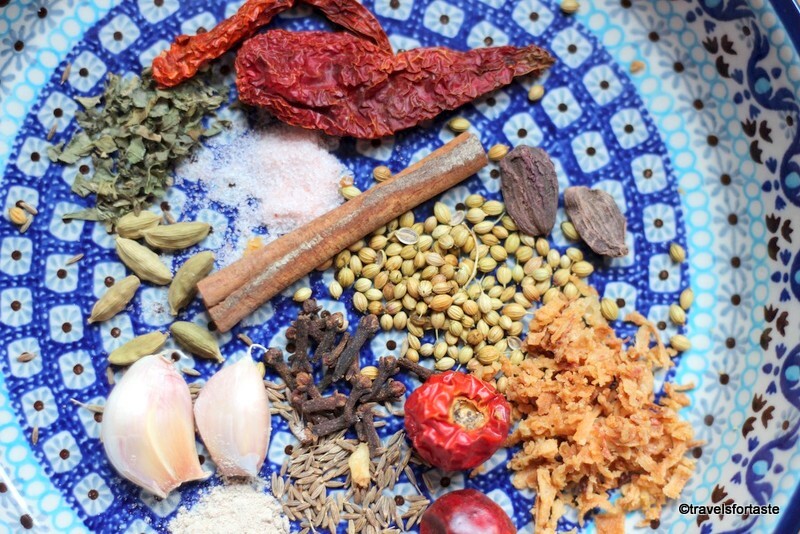 Why not try my recipes for BBQ/ grilled lobster tails and Haddock fillets with this spice rub? A freshly made coconut chutney served with steaming hot idlis or a crisp dosa hot off the pan, is a thing of delight. 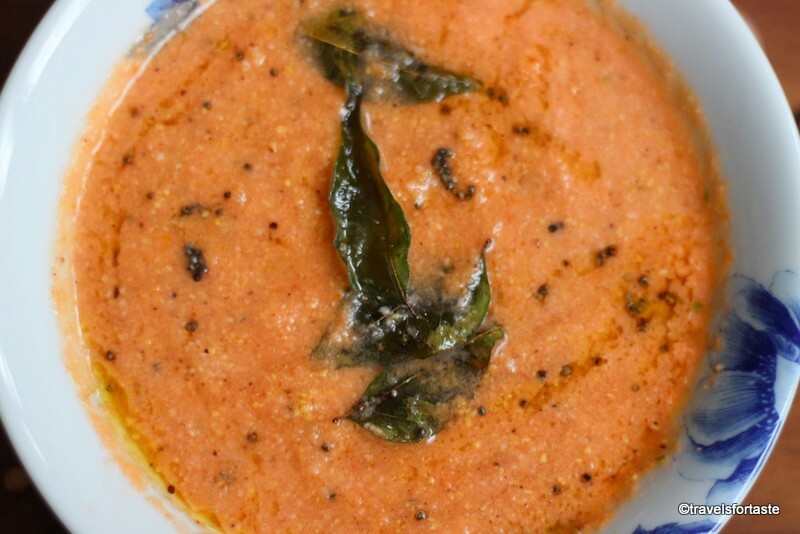 There are many varieties of this coconut chutney, but I prefer the one with tomatoes. It just adds that much more depth of flavour and dimension. This easy recipe becomes even more fun to create when using a powerful blender like my new Optimum G.21 Platinum blender . Why ? Because the speed and convenience of having a pre-set function to grind means the job is done at the press of a button. Besides the consistency and texture of the chutney is perfect. Freshly made tomato and grated coconut chutney. Heat a pan on a medium flame and pan roast the chana dal till it turns a dark brown colour, do not allow it to burn, gently keep moving it on the pan with a wooden spatula. Set aside to cool. Halve the tomato and add into the blender. 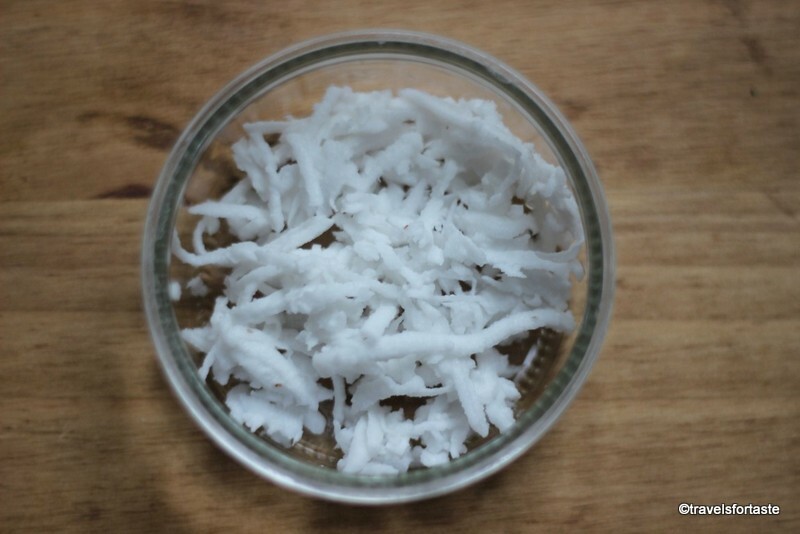 Add the freshly grated coconut, I buy a frozen packet from my local Indian store, have a look at the photograph in my post. Remove the skin of the ginger - this is best done using the back of a spoon if the ginger is fresh - it will come off easily , of not use a knife. Now add the garlic cloves, kashmiri red chillies and salt. Add about one and half tbsp water and grind to a thick coarse paste like consistency. The water level depends on how you would like the consistency. I generally add a little more water after the first grind and give it one more pulse in my Froothie to get a better poruing consistency. Heat the oil in a kadhai or saucepan and add the mustard seeds in the hot oil. Once the seeds begin to pop add the urad dal and let it brown, then throw in the fresh curry leaves. 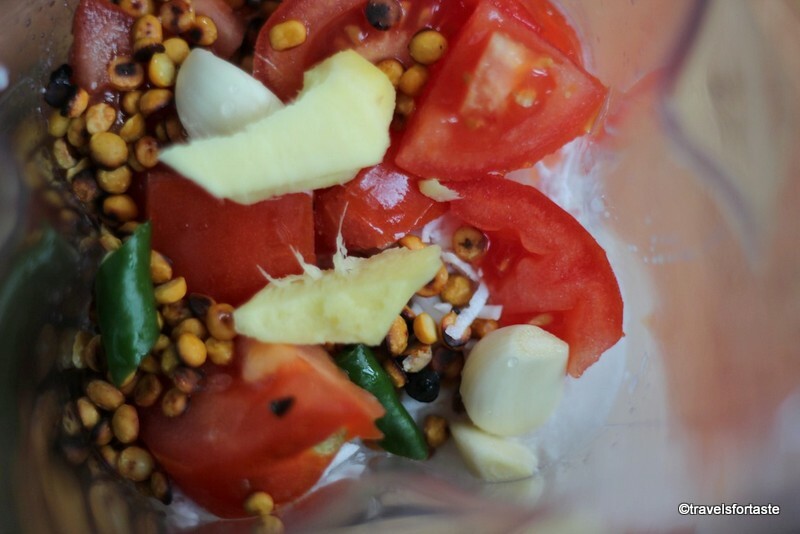 Pour this hot tadka mixture onto the chutney and serve fresh with steaming hot idlis or dosad. A peek inside the blender .. If you are not using the Froothie power blender, then chop the chillies roughly into small pieces, repeat with the ginger and garlic too. 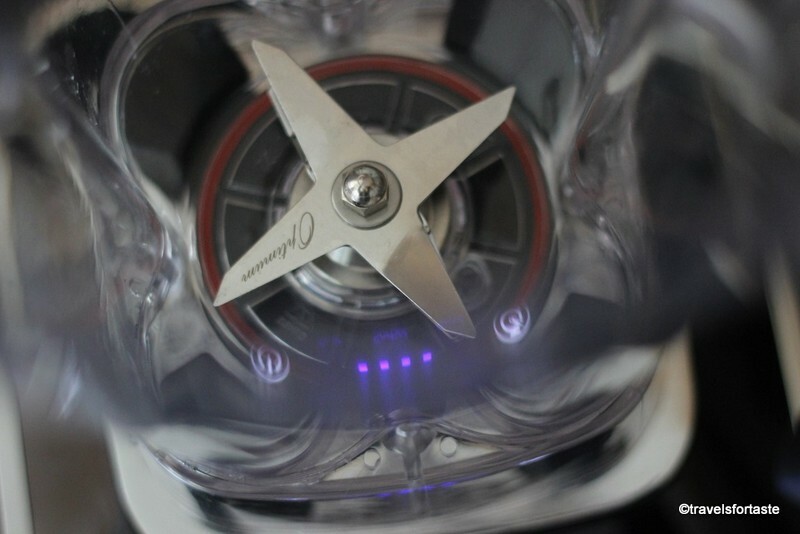 This is because the sharp blades of the Optimum G2.1 Platinum blender will be able to easily grind the whole ingredients, a task that a regular mixie will struggle with. I add the dried red Kashmiri chilli for its colour as well as flavour. In many of my curries I just these chillies whole to add a hint of flavour. But remember once made into a paste these chillies release their hidden potency – it’s a very different beast then and the heat can be really intense. So if you don’t deal with heaty – spicy chillies well then use only a half of a Kashmiri chilli in this chutney. It will still add a dash of colour and flavour without scathing your palate. And the green chilli gives it necessary flavour which I find very distinctly pungent and traceable when I eat this chutney, if it was missing I would know instantly and would miss it. 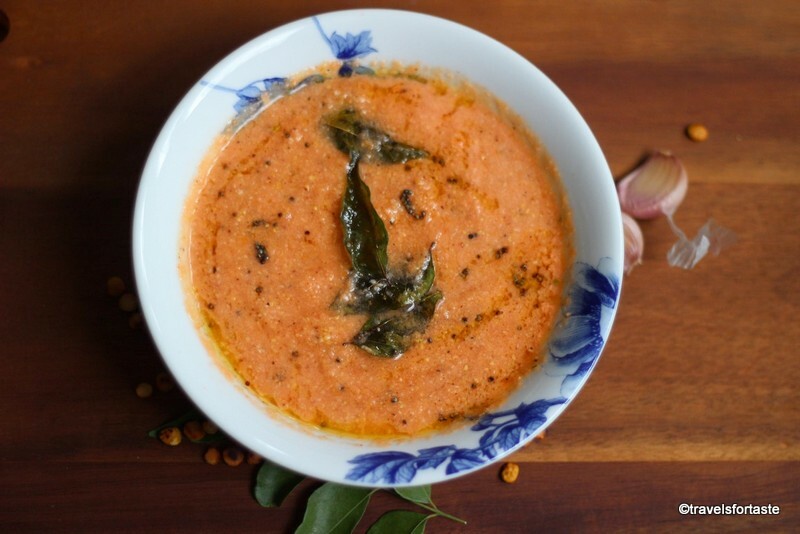 The fresh taste of the chutney and the crunch of the curry leaves is simply irresistible, the tomatoes add just the right amount of tang to this beautiful chutney. Typical to the South of India this recipe is something that most families make with variations of their own. Some even prefer to add some onion or roast the coconut before adding to the blender. 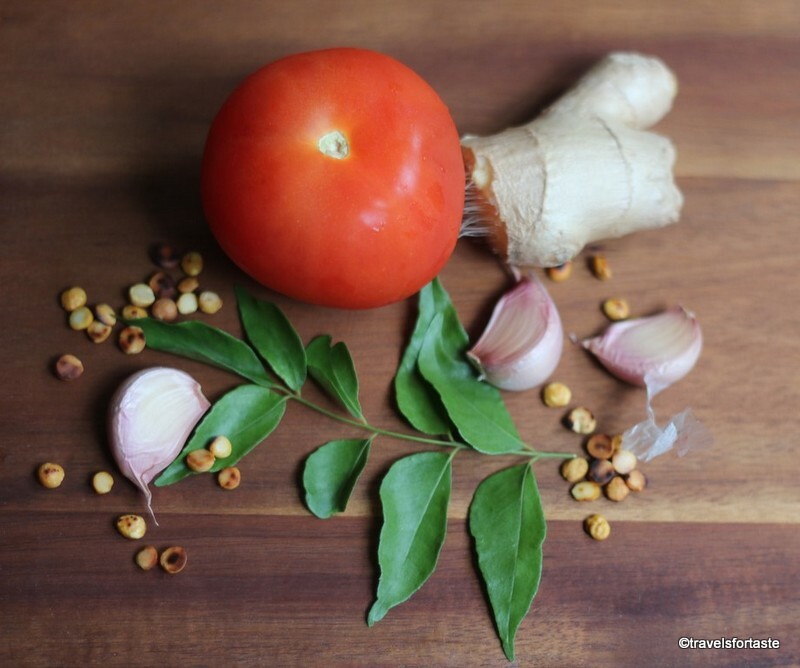 whichever recipe you use this chutney will never go out of fashion. *I am an ambassador for Froothie and was sent a Froothie Optimum G2,1 Platinum blender for review. This post has affiliate links. When I first moved to the U.K the one kitchen appliance that I really missed was my ‘mixie’ I relied heavily on my old beat up noisy mixie or mixer as it is popularly known as, especially, when I wanted to make chutneys or grind soaked grains. 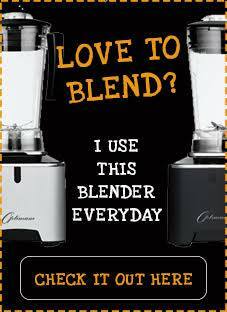 In the past five years, I have tried several blenders and food processors and never really had satisfying results. 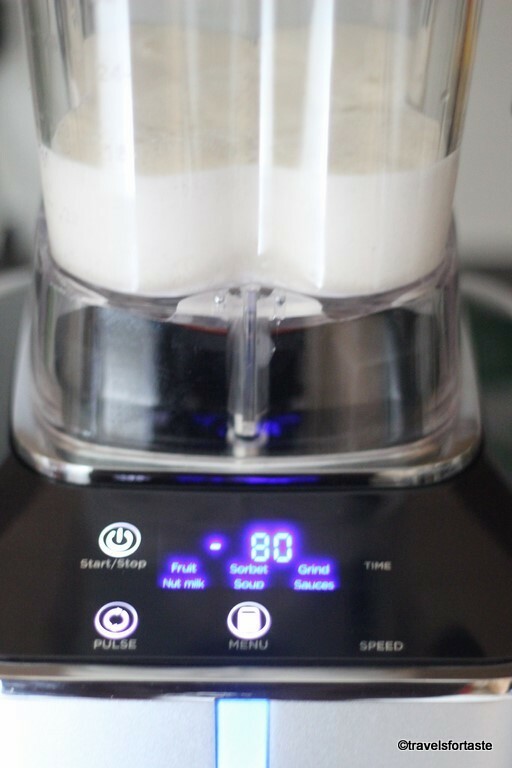 Fast forward to 2016 – When I was offered the opportunity to become an ambassador for Froothie UK and sent the new and shiny high-speed Optimum G2.1 Platinum blender to test and review, the very first thing I wanted to try was making an idli batter with a home made coconut chutney. I am delighted to announce that the results are really very satisfying. The 6 blade assembly makes it very easy to grind grains so my soaked rice and urad dal mixture reached the right consistency in no time! I am so relieved that I do not have to keep blending and adding more water than required to reach the right consistency for my idli and dosa batters. Even bigger relief is in knowing that freshly grated coconut can be turned into a fabulous chutney within seconds. This especially is a blessing, considering that my parents had to lug a heavy mixer all the way from India, just so that I would stop complaining about how difficult it is to grind dals or make coconut chutney. Sorry Baba for all the trouble you had to go through to lugging that device all the way to London! When you are looking to purchase a high investment appliance like a power blender, comparisons are a part of the process. 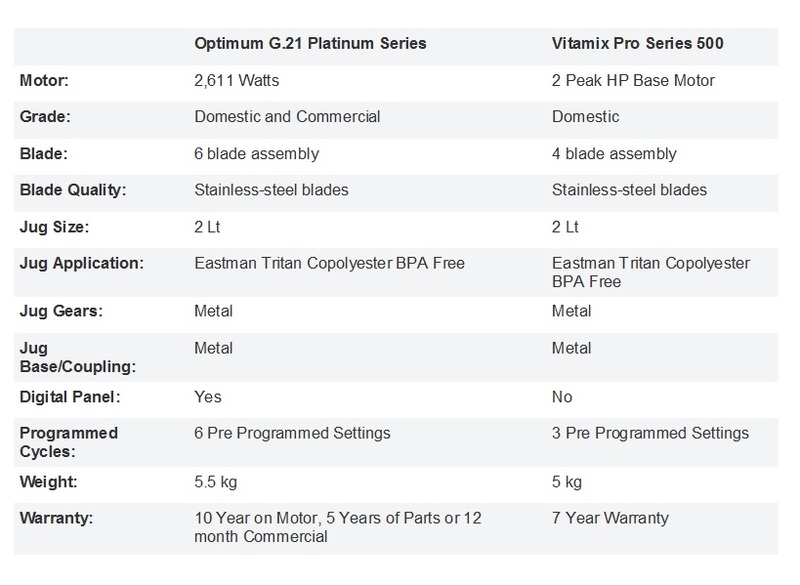 Froothie has made it easy for you to make that decision with this table comparing the Optimum G 2.1 Platinum blender to a Vitamix – Pro series 500. Ease of Use, sturdy jug and intelligent overload protectionThe best part about the Optimum G2.1 Platinum blender though is the ease with which the sturdy Eastman Tritan Copolyester BPA Free jug sits on the base – no twisting and turning and waiting to hear a click – just simple fit,plug and play. I recollect the horror I felt when the plastic edge of my food processor chipped while I struggled to fit it into the grooves of the base, only days after spending quite some money buying it, about three years ago. What a nightmare that was. The Optimum G.21 also comes with intelligent overload protection meaning the built-in sensor automatically switches off the motor in case, over-heating is detected . This prolongs the Optimum’s operating life while pre-empting and avoiding breakdowns. If the blender should ever trip, all you have to do is simply switch it back on. The idea of making a soup in minutes is so appealing and especially to a person like me who is trying very hard to loose weight. Not only am I trying to loose weight by eating healthier am also helping my husband throw off excess weight faster by making better food choices. It is a boon to be able to relish fresh homemade soups every single day in less than ten minutes thanks to heat created by friction. Nothing beats smoothies packed with fiber and that is something you can enjoy daily, fruits go into this beauty with skin and without chopping – yes you read that right. Brilliant, isn’t it? A heavy duty tamper tool has also been provided for improved processing and mixing. If you need recipe inspiration your blender comes with a recipe book with 80 inspiring ideas for you try at home. I am yet to make any flour in new Optimum G2.1 but that is because I have been so obsessed with soups, smoothies and chutneys! Buckwheat flour is ready in 10 seconds flat – need to see a demo?Watch this video on the Froothie TV channel, they have a whole host of fab videos from recipes to comparisons with other brands and tests too. The optimum now comes with a free nut milk bag too as part of the package. Why not make the most of a great limited time offer which expires on the 30th of April’2016 and save £170 on your purchase ? 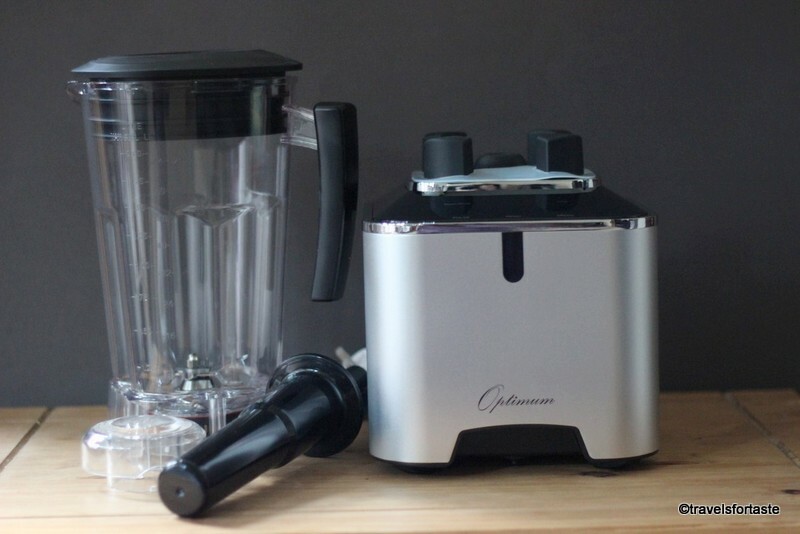 Get the Optimum G2.1 Platinum blender for £429 instead of £599. To ensure that the ordering is smooth and delivery process hassle free Froothie U.K uses a next day courier service and you get your blender delivered with 24-48 hours. There’s also a 30 day trial with a money back guarantee which includes return postage costs, but am pretty sure that won’t be necessary! Ok now for my recipe, I have followed the late master chef Tarla Dalal’s easy to follow recipe, for my Steamed Idli’s recipe but have adjusted the proportions to make approximately 15 idlis – the number will vary based on the size of the moulds. A Quintessential south Indian delicacy which makes for a guilt free meal considering it is steamed and wholesome. Soak the rice in water in a bowl and the fenugreek seeds and urad dal in another. Add enough water to allow the dal and rice to absorb the water and then some. Soak for a minimum of 4 hours. Drain the excess water from the rice and add in the blender - enough to get a pouring consistency. Repeat with the urad dal and fenugreek seed mixture - this mixture will get very thick while blending so you may need to add in more water as required. This mixture gets frothy while blending which is perfectly natural. Mix both batters and set aside in a warm place to ferment - it took my batter 24 hours to ferment. Fermentation slows down when the temperature is low. Season the batter with salt after it has fermented. 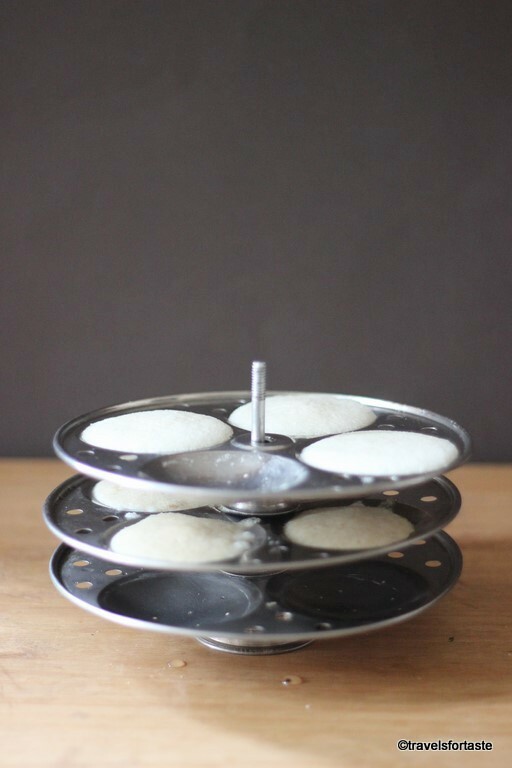 Grease idli moulds and spoon the batter into the moulds. 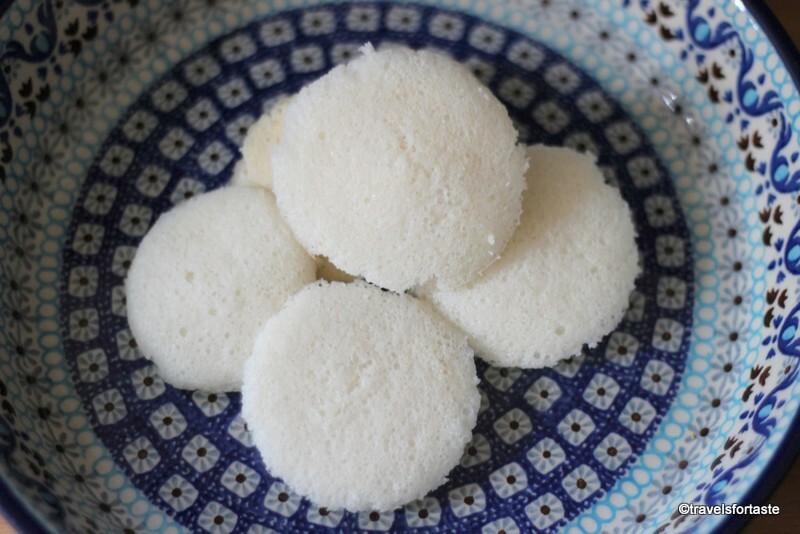 Steam the idlis in a pressure cooker or idli steamer for about 12 minutes. Take care while removing the hot idlis from the pressure cooker, to avoid steam burns.Serve the steaming hot idlis with coconut chutney. Serve as a breakfast dish for a weekend treat, actually this is dish ideal for any meal. *I am an ambassador for Froothie and was sent a Froothie Optimum G2.1 Platinum blender for review. This post has affiliate links. No monetary compensation was offered for a positive review. As always all opinions expressed here are entirely my own and I only endorse products that I love and have experimented with. I am on a road to discovering and working with various ideas to create and eat lighter, healthier meals and on one afternoon a few days ago I was faced with a dilemma. The kind of dilemma where one has an apparently full vegetable tray in the refrigerator but consisting of a large variety of this and that. 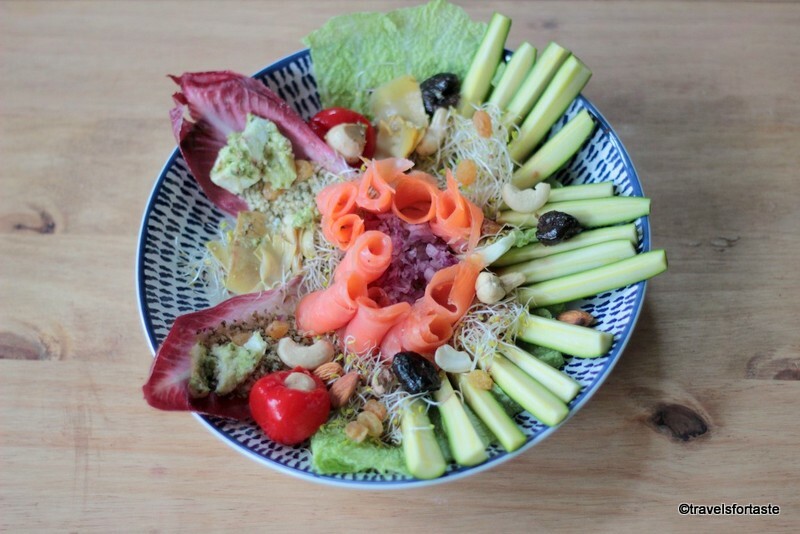 So the salad recipe below is my way of utilising all those beautiful ingredients, preventing food waste, making the most of what my store cupboard essentials and coming up with a healthy meal. I love smoked salmon so always seem to have some in my refrigerator and also had some antipasti ingredients in what remained for a large mix-n-match box from my last visit to Whole Foods.But the best part was finding some good salad leaves which were fresh and the savoy cabbage that would die soon. In a bowl add the shelled hemp, chopped onion, salad leaves- red chicory and savoy cabbage, Alfalfa sprouts, Baby courgettes and add a generous slosh of Chocolate balsamic vinegar. On a bed of salad leaves arrange the help and onion mixture and place the smoked salmon slices. 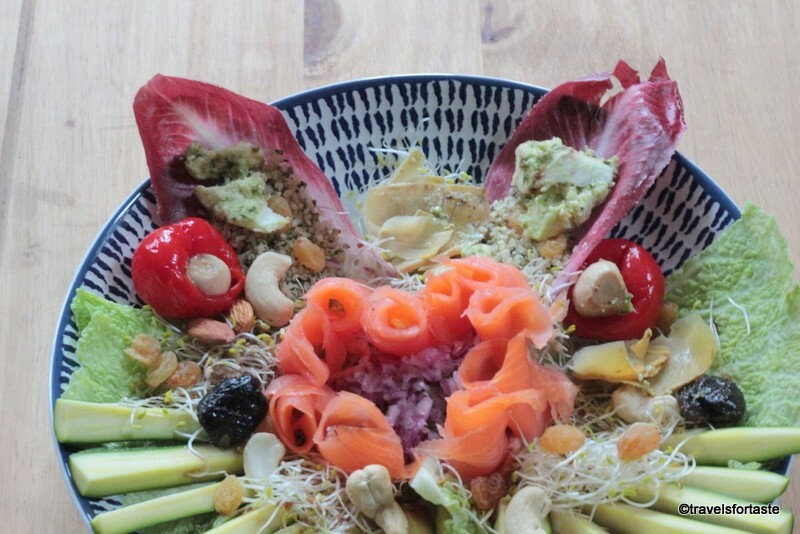 Arrange the mini red peppers stuffed with cheese, artichoke hearts around the salmon. Garnish with mixed nuts and enjoy. 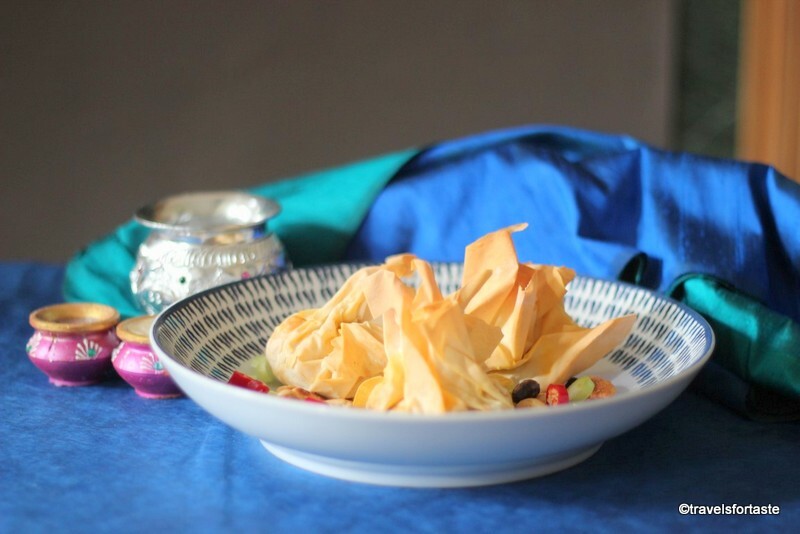 And since I am hosting #CreditCrunchMunch for March 2016 I am linking up this recipe made using leftover ingredients and some vegetables that would otherwise have wilted and died like cabbage, or the last bits from my antipasti box – a thrifty recipe idea I say! #CreditCrunchMunch is a fab link up started by Helen of Fuss free flavours and Camilla of Fab food for all. Don’t forget to link up your thrifty ideas with my guest hosting post here.